Alberni Valley Bulldogs GM/Head Coach Nolan Graham is pleased to announce the signing of (91) Forward Trent Dorais. Dorais, a native of Vernon BC, split time in 2008 – 2009 between the Vernon Vipers (BCHL) and the Sicamous Eagles (KIJHL). In 28 games with the Vipers, Dorais scored 3G – 7A – 10PTS - 28PIM. Dorais helped lead the Sicamous Eagles to the KIJHL Conference final, where the Eagles eventually fell to the Kamloops Storm. Dorais put up 7G – 18A – 25PTS - 133PIM in 41 games last season (regular season and playoffs) with the Eagles. A reminder to all current season ticket holders, that the deadline to secure your seats for the 2009 – 2010 season is approaching. Current season ticket holders have until June 4th – 2009 to reserve their seats for next season before they are opened up to the general public for purchase. A huge congratulations to former Bulldogs Trainer/Therapist Matt Auerbach (now with the Chilliwack Bruins) as he has shown up on the radar of Hockey Canada. See HERE. Congrats Matty! 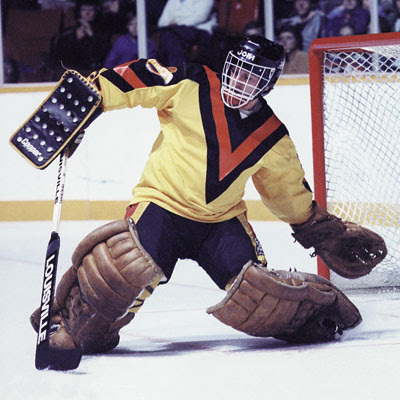 Don't miss Monday's edition of THE PEAK morning show, as I'll be joined by former NHL referee and Port Alberni Native Rob Schick just after 8:10am to talk about the Alberni Valleyt Charity Golf Classic. Rob of course started the tournament, wayyy back when, like when the Coyotes were the Jets! If you miss it live, I'll get a copy for the blog. That's it, enjoy the weekend, slather on that sunscreen!! Bulldogs to announce new addition - Interview TOMORROW on THE PEAK, Bryant Perrier to the MJHL. 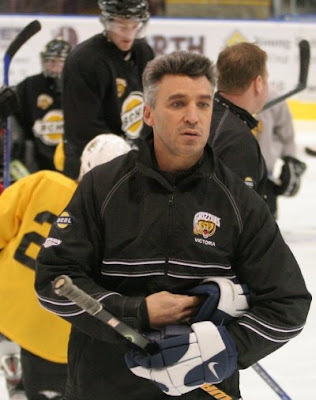 As reported by someone in the comments section of my last post (with credit to Gregg Drinnan's blog "Taking Note" (www.gdrinnan.blogspot.com) former Dogs coach GM Bryant Perrier has been hired by the MJHL's Neepawa Natives. All the best to Bryant in his new challenge! The Pittsburgh Penguins are off to the Stanley Cup Finals again, after a 4-1 win over the Carolina Hurricanes last night. And.....GASP!!... Sidney Crosby TOUCHED the Prince of Wales trophy! But hey - last year it was a "no touchie" acceptance of the trophy and they didn't win the big one so maybe that's Sid's line of thinking. I wonder if he asked his teammates for their thoughts first? Kind of hard to do that until you've actually won it. Interesting anyway. Where did the whole "no touching" thing come from anyway? I only remember it from the Jerome Iginla acceptance in 2004. And it didn't work then either. I have not watched one SINGLE game of the Conference Finals. Sad but true. Too busy. Go Pens Go now I guess. Unless the Hawks have a miracle of a comeback in them. PLEASE, ANYONE but the wings. Heck I'll even cheer for the Flames before I cheer for the Wings!! 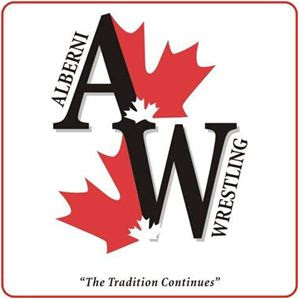 Alberni Wrestling received another national accolade recently with the selection of school and club coach James Messenger as one of the coaches of Canada’s Cadet Women’s team. The National FILA Cadet team focuses on wrestlers 16-17 years of age and Messenger will lead his team to Turkey May 25- June 3 for a major international tournament and then later a high performance summer camp in Ontario in July. Messenger is the only BC coach selected and will form part of a National Cadet coaching partnership announced by Wrestling Canada that includes …..
Wrestling Canada also announced the Men’s and Women’s teams …. Unfortunately Alberni didn’t see any of our local athletes selected for the team this year. The FILA Cadet team actually covers wrestlers a year older than the normal Canadian Cadet ages of 15-16. Most of the National team are 17 year olds. Alberni’s National Cadet Champion Isaiah Taylor is just 16 and could have a shot at this team next year. 2008 National Cadet Champion Savannah Toth was close to making the team this year as a 17 year old. The fact that Alberni has these and many other young athletes excelling at the National level certainly was factor in Messenger’s selection as a National coach. Messenger graduated himself from ADSS in 1998 after being part of the vaunted ADSS men’s team that won three BC High School titles in a row from 1996 – 98 that included future Olympian Travis Cross. Messenger started his wrestling career at Mt. Klitsa Junior High and after high school he went on to Simon Fraser University on a wrestling scholarship. He received his teaching degree at SFU and returned to the valley in 2003 to teach and was fortunate to get a position at Dunn Middle School where he continues to teach. Congrats to James and everyone with Alberni Wrestling! Just wanted to let you know that Adam left yesterday for a month-long backpacking trip to Europe. He will be backpacking through England, France and Italy with three of his best buddies from high school. It should be a trip of a lifetime, but we could sure use your prayers for his safety and his buddies safety. Hope all is well with our good friends to the North. Have fun Houter, and BRING ME BACK SOMETHING NICE PLEASE! 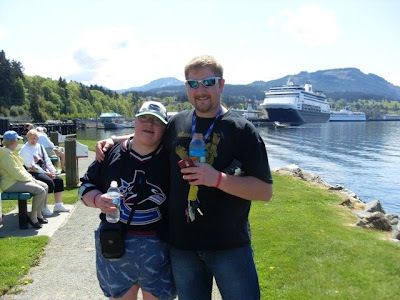 From the 93.3 The Peak FM morning show today, here is a copy of the interview I had with Matt Hatch, the newest member of the Alberni Valley Bulldogs. As always, all audio is courtesy and copyright 93.3 The Peak FM and the Jim Pattison Broadcast Group. Please excuse the lack of blog updates lately. News has been a little slow, and I've been extremely "fast" working some extra hours hanging out with my buddy Jade. Check out the great pic below from last Saturday with the Holland America Line's Statendam in visiting Port Alberni for the day. There was some great news out of the Bulldogs office yesterday. First off was the announcement that Colin Rundell has secured an NCAA scholarship at UAF. Huge congrats to "Rundy" and his family as well as the coaches and Educational Advisor Tom McEvay for all of their efforts to make this happen. It's what the Junior A game is all about! With the Alberni Golf Club's Charity Golf Classic coming up in July, it's time to get the word out and fill up the tournament teams. Richard Brodeur has been a frequent player in the event and he'll be back again this year. Tune in to THE PEAK just after 8am today for an interview with THE KING along with Alberni Golf Club President Les Doiron, and Gerry Fagan from the organizing committee. The Bulldogs completed their coaching staff today by announcing Brian Vines as their new Assistant GM and Assistant Coach. The Alberni Valley Bulldogs announce the hiring of Bryan Vines as Assistant General Manager/Assistant Coach of the Alberni Valley Bulldogs. Vines joins the Alberni Valley Bulldogs after serving last season as the Assistant Coach for Miami University – Ohio while also working towards his Masters Degree. Vines was an instrumental part of the RedHawks history making season. The RedHawks lost to the Boston University Terriers in NCAA Final last season, the first time in school history the Mens Hockey team played in the NCAA Div I Finals. Prior to Miami University – Ohio, Vines spent three seasons as the Video Coach for the Colorado Avalanche of the National Hockey League. Vines was responsible for breaking down game film and conducting team video sessions. A defenseman as a player, Vines spent four seasons at Denver University where he led the team as Captain his senior year to a 32-8-1 (21-6-1 WCHA) record. Following Denver Vines played two seasons in the minor pro hockey ranks, splitting time between the Long Beach Ice Dogs and the San Diego Gulls. Vines grew up in Ontario and will be moving to the Alberni Valley prior to the Bulldogs training camp in August. With one addition to the coaching fraternity, there is also a deletion as Geoff Courtnall has ended his tenure with the Grizzlies in Victoria. Thanks Danno for the heads up. 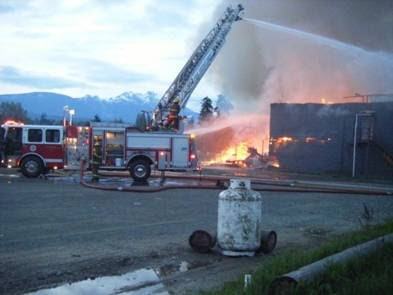 A sad day today for residents of the Alberni Valley as the Athletic Hall was lost to fire this morning. Officials first arrived on the scene around 4am. The hall was the home for too many events to mention...graduation ceremonies being the big one that most people have referenced to me today. You remember your grad forever. The Hall was also home of course to the Alberni Athletics, former National Champions of Canada in Senior Men's Basketball. She'll be missed for sure. 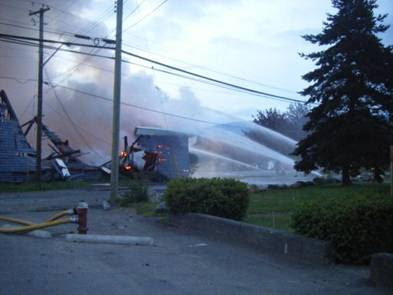 The building WAS insured, as far as I've heard no causes of the fire are known at this time. Those waiting to know who Nolan Graham's assistant coach will be, won't have to wait much longer. The Bulldogs have told me that they expect to make an announcement by Friday. Stay tuned to THE PEAK and this blog for more information. 'Nucks done, Caps force game 7, great FLIN FLON story. Well, what to say about the Vancouver Canucks? They battled hard for sure, coming back from a 3-1 hole, taking several leads including a late one. But they just couldn't hold off the Hawks and there will be no Game 7 at GM Place and no parade down Robson. Wow. I'm not about to hang him, like it seems every one else wants to do. He was beaten for the most part on absolute beauty goals, or just back luck goals, like the Brouwer goal or the Kane wrap around. At the same time, I of course concede he certainly wasn't the DIFFERENCE for the right reasons. Didn't steal any games. And that's what a 7 million dollar man is supposed to do. So, what now? Who knows. Cheering for the Caps I guess, as they beat Pittsburgh on the road last night to force a game 7 tomorrow at Verizon Center. AND I think I'll jump on the Hawks wagon now. Now, I don't want to paint myself as a total bandwagon jumper here....I have been cheering for the Hawks for the last couple of years, as I have a mentor-tutor relationship with their radio play-by-play voice John Wiedeman. It was even easier to cheer for the Hawks this year as opposed to years previous, as ownership changes saw their fanbase return and their building sold out on a regular basis. I've said it countless times before - with the way the NHL is now, I pull for teams in good hockey markets with good fanbases that care about their club to succeed to give their fans something to cheer about. Seeing the Carolina Hurricanes Stanley Cup Party attended by a dozen people a couple years back is a good example off the top of my head as to why I cheer how I cheer. The Hawks have drawn over a MILLION fans this year. That's awesome for an original 6 club that was drawing under 10,000 people maybe just 2 years ago. A final comment - they don't just WIN. As you saw this entire series, and last series against the Flames - they ENTERTAIN. Flash and dash and speed and skill. Fun to watch, easy to cheer for. OK - Let's talk a moment about my great home town of Flin Flon, Manitoba. NO, not because it's Manitoba day today - yes, Manitoba became a Canadian Province this day in 1870 - but because I came across a great link on Gregg Drinnan's blog Taking Note that lead to Ron "Scoreboard" Johnston's blog on Regina Pat's History. In his latest report, Ron details what a trip to Flin Flon was like back in the 60's. And it's not much different now. "Ah, a Prairie boy, eh?" "hahaha what do you mean, NO"
And then I go into my usual speel that Flin Flon is in Northern Manitoba on the Canadian Shield, all Precambrian Rock. There's more flat land to be found all around Port Alberni than there is in Flin Flon. I usually get the "yah well there's still no Mountains" which is absolutely true. I never claimed there were Mountains. I just said it wasn't prairie, and it wasn't flat. ROCK ROCK ROCK LAKE ROCK LAKE LAKE LAKE ROCK ROCK ROCK. Is basically how it goes. Why does it fire me up so much? I don't know, I guess I just don't want to be branded what I'm not. And who really does? ANYWAY - I digress. If you'd care to INFORM yourself, please visit Mr. Scoreboard's blog at the link below. It's a neat story with some great pictures that might make some people understand where I'm coming from! The two teams I'm pulling for the most in the Stanley Cup Playoffs are on the verge of elimination tonight as the Canucks visit the Hawks and the Capitals face the Penguins with both teams sitting in 3 games to 2 holes in their respective series. Catch the game tonight on THE PEAK with the pregame show beginning at 5:30 with the puck drop and play-by-play to follow shortly after 6:00pm from the United Center in the Windy City. A huge congrats to the Vernon Vipers (and former Dog James Kerr) for capturing the RBC Cup yesterday in Victoria with a 2-0 win over the SJHL Champion Humboldt Broncos. GO NUCKS GO, and to quote Will Smith from Independance Day "I HEAR NO FAT LADY!" Canada vs Russia for World Championship Gold, Vernon vs Humboldt for RBC Cup, Happy Mothers Day! Hello and thanks for visiting the blog. A couple quick words on the last couple of days. I know the flu bug is going around Port Alberni a little bit at the present moment. I got a little 24 hour Friday that kicked me pretty hard Friday night, and I know of a couple others that have had it to. Wash those hands, you don't want what I had! Neither of my teams pulled it out yesterday, with the Washington Capitals losing on a really tough break in OT and the Canucks giving up the winner late and then having a comedy of errors with the net empty to give up the insurance marker. The highlight of the night was the look on Alain Vigneault's face when they showed him after the goal. It was a the deer in the headlights "what in the name of the holy hockey gods just happened" look. What made it funnier was a text I received from a buddy in Manitoba a moment later saying "Did you see the look on the coaches face, wow, hilarious"
I did think it was funny, but it's also hard to laugh with the 'Nucks all of a sudden down 3-2 in the series, trailing a series for the first time actually. Highlight of the game for me was Rick Rypien throwing more hits in one shift than the rest of the team threw in the entire game. If everyone was playing like that all the time, the Hawks would be roasted by now. I'm not counting the 'Nucks out, but top to bottom everyone needs to elevate in a hurry. No problem! The most historic match up in the game kicks off again today with Canada vs. Russia for the World Championship of Hockey up for grabs. Catch the broadcast on TSN online or on your TV. TSN has NHL hockey this afternoon, which means the RBC Cup finals will be on TSN 2. I don't have that, so I guess I have to go to Victoria to watch the final in person! There is PLENTY on the line today - Read up from the Hockey Canada site as Vernon is set to take on Humboldt....GO BCHL! One more tip of the cap to Kevin Ross, who won the RBC National Scholarship Award..
Today is Semi-Final Friday at the RBC Cup in Victoria. As the title says, an All-BCHL final could still happen. Or at the same time neither team could make it. For more info, check out this update from the BCHL website. I received word today that Bulldogs D-Man Kevin Ross will be on the A Channel sports tonight with Mira Laurence. Kevin of course is at the RBC to receive his National Scholarship Award. Congrats Kevin, and hopefully we'll see you on the 'tube tonight! 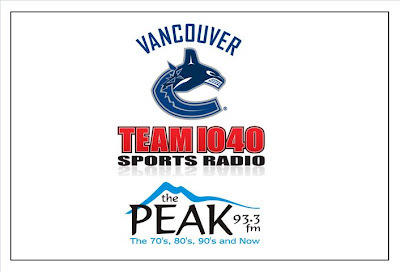 Catch the Canucks visiting the Hawks tonight on 93.3 The Peak FM with the pregame show kicking off at 4:30 and the puck dropping shortly after 5pm. You have no doubt heard that Jim Balsillie wants to buy the Phoenix Coyotes and move them to Southern Ontario. I say LET HIM buy the Coyotes. And put them BACK IN WINNIPEG. After all, Gary Bettman's response to this issue was "The NHL doesn't give up on cities, yaddah yaddah" Well you gave up on Winnipeg. 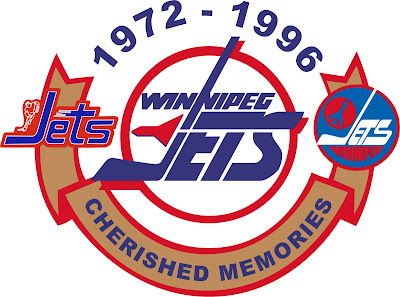 Winnipeg has fixed it's problems, the NHL has fixed some of it's problems, BRING BACK THE JETS! Here's an interesting story from the Nanaimo Daily News by Michael Rhode, regarding ticket prices and attendance numbers at the RBC in Victoria. Click THIS LINK to read it. My 2cents on the subject...I knew the RBC wouldn't be a hit unless several things came into place. Those factors being - the Grizzlies winning their way there and not backdooring, the 'Nucks being out of the playoffs, and the Salmon Kings not making the playoffs or getting knocked out EARLY. I don't pretend to know Victoria and what goes on there, I just know what I have seen over my 6 years in the league and being to games down there. It is absolutely BEYOND ME how in a market the size of Victoria, NO ONE can get their games broadcasted on one of the local radio stations. The Salmon Kings of the ECHL, the Grizzlies of the BCHL (even with the RBC Cup) can't get it done. I almost want to kick down an office door of some radio and team executives and get it done.....I don't know who's to blame so I won't be faulting anyone. But I bet it's both sides, and I bet it's GREED. Maybe it's the community. Maybe they just don't care. I don't buy that though. I have seen games in the Bear Mountain in the SECOND ROUND of the playoffs where the barn was packed to the rafters. Now in the RBC they can't get 2000 people? Hmmm. Anyway. Smaller cities = success, when it comes to the RBC. Port Alberni anyone? 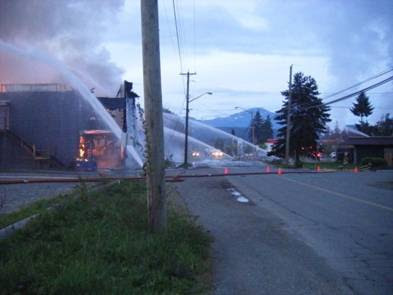 Speaking of a SMALLER city (Port Alberni) - and an INTERNATIONAL EVENT ( the 2009 World U17 Challenge) please read more below. When events go well - this is the spin off. 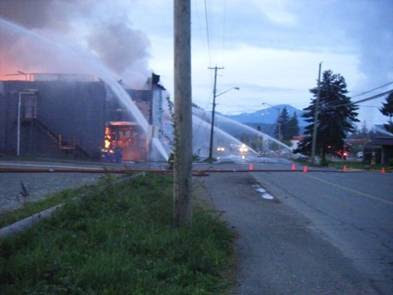 I shouldn't give Port Alberni all the credit, the partner communities were there every step of the way too. 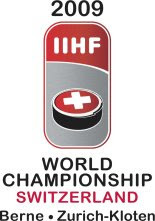 The 2009 World Under-17 Hockey Challenge host committee, BC Hockey and Hockey Canada invite you to attend an information session to provide full details on allocation and distribution of the $250,000 Legacy Fund. Special recognition presentations will also be made to the funding partners and sponsors whose support helped realize this substantial Legacy Fund. Quite the complete game for the Canucks last night in Chicago as they beat the Hawks and took a 2-1 series lead with a 3-1 win. I had to laugh at Jim Hughson because he said what everyone was thinking when the Canucks took a 2-0 lead - "now the Hawks have them right where they want them!" Not this time. The 'Nucks bent but didn't break. The Hawks couldn't stage a comeback this time. I don't know about you, but I love the noise in the United Center. I like a noisy building, period. More emotion, more excitement, better hockey. Game four goes Thursday at 5pm from the Windy City. Pregame show on THE PEAK kicks off at 4:30pm. Tough one for the Wings last night...I absolutely LOATHE the Wings, so I don't care much...BUT if that's happening to MY team or YOUR team at this time of year...well I know I'd be mighty P-O'd. In the battle of the BCHL last night at the RBC Cup, the Vernon Vipers erased a two goal deficit after 40 minutes to beat the Victoria Grizzlies 5-4 in OT. The Snakes are 3 and 0, while the Grizz are 1 and 2. Huge congrats to the Alberni Armada Golf Club, and a huge thanks to coach Bob Matlock for sending me this update...Way to go guys! Club on Tuesday for the North Island AAA Golf Tournament. Island Tournament next week, on May 12th at Gorge Vale Golf in Victoria. had seven birdies on the day. team total score is based on the four best scores for the day. May 25th ,26th and 27th, 2009. The Alberni Valley Minor Lacrosse Association (AVMLA) Bantam Tyees started the lacrosse season with a strong start, notching three wins on the road in their first four games. The Tyees opened with a doubleheader in Campbell River on April 19. With little practice, no game play together and no regular goalie, the Tyees controlled the ball well in racking up an 11-5 victory. Connor Gagnon had four goals, Captain Ryan Buse had a hat trick and Corey Beecroft two goals. Beau Wilson and Reed Garcia had singles and Buse, Wilson and Hughie Watts earned assists. The defence was solid and Nathan Read adapted quickly to his fist time in goal. The Tyees repeated in the afternoon, but the game was much closer. The score was tied at the end of the first period and again after two. The Tyee defence shut down Campbell River in the last period and at the other end scored twice for the 10-8 win. Garcia, Jessie Geddes and Wilson had two goals each. Beecroft, Buse, Logan Savard and Jordan Lavertu notched singles and assists went to Garcia, Buse, Lavertu and Gagnon. The Tyees played another doubleheader in Nanaimo on April 26. In the first game Nanaimo scored first, but the Tyees responded with five unanswered goals, including two shorthanded to finish the first period up 5-1. After that they coasted to an 8-3 win. In the afternoon, hot goaltending made the difference in Alberni’s first loss. The Bantam Tyees’ first home games are scheduled at the Multiplex (Weyerhauser) on Sunday, May 10 against Victoria-Esquimalt at 12:30 and 3:30 p.m.
That's it for now...More later, including an update on the 2009 World U17 Hockey Challenge and a press conference they'll be holding on Friday. WOW. Just WOW last night. Kudos to Crosby, yaddah yaddah yaddah. I love the fact he battles, he's Canadian, he says all the right things, yaddah yaddah yaddah....but Ovechkin makes me jump out of my seat while Crosby makes me...I'm not exactly sure. Everyone already knew how the two players are different. But has there a better clear-cut example than what we saw last night? Crosby scores three goals, from a combined total of three feet away from the net. Ovechkin scores 1- a cross ice one-timer on the rush. 2 - a cross ice one-time off a face off. and 3 - a top shelf snipe on the rush on a 1 on 1. Again - This isn't a Sidney Crosby bash fest or anything. 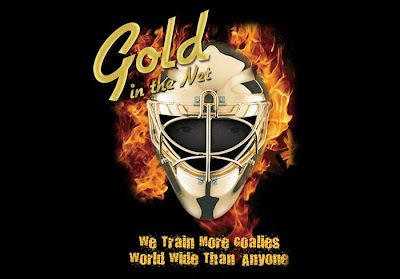 I love the gritty hard working nose to the net kinda guys...But I also love the flash and dash and "WOW" guys. The best of them all, Ovechkin. And how about the crowd in Washington? Awesome. PS - BOB COLE can still RIP IT. The Canucks are back in action on 93.3 The Peak tonight as they visit the 'Hawks at United Center with the Western Conference Semi Final series knotted at a game each. We've got the pregame show for you kicking off at 5:30pm, with Tom and Shortie with all the play-by-play shortly after 5:00pm. The Gold In The Net Golf Tournament, to support the Aaron C Cornwell Memorial Scholarship fund, was an awesome time on Saturday at Morning Star Golf Course in Parksville, even if the weather didn't cooperate. 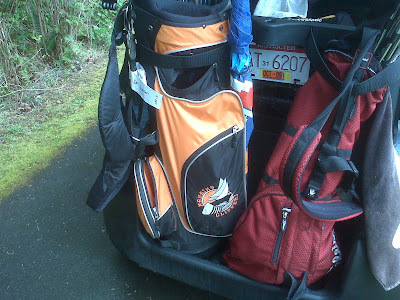 I walked up to the first tee to see who I was playing with, and I was greeted by the golf bag you see below....and I thought "this might be interesting"
Also on my team was Joey "K" Kozakevich, pro rep for Vaughn Canada and Frank "the tank" Slubowski, Gold In The Net product and Bulldogs goaltender. Usually with tournaments like these, you can tell on the first tee if you have a team or not..well I watched Sean hit first, and he cranked one down the middle and I thought "hmmm, not bad" Joey went next, and he also striped one down the pipe, and I thought "that's it, we're winning this thing"
And win it we did. Frank and I chipped in here and there with our shots, but the credit goes to Sean and Joey. Guys - I suggest Robaxacet if your backs are sore from carrying the team! Thanks for the great time! I took some video clips that I will be making into a highlight video, so check back for that in the future. 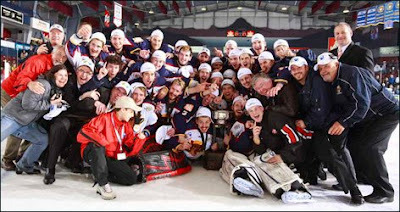 The 2009 RBC Cup is on as we speak in Victoria....Check out the BCHL homepage at www.bchl.bc.ca for updates regarding the BCHL clubs, and hockeycanada.ca for the tournament homepage! THANK YOU THANK YOU THANK YOU MIKE BROPHY. Someone has some sense. At least someone has some sense in my humble opinion, when it comes to hockey broadasting now a days. "* Craig Simpson gets it. The former NHL star and color commentator for Hockey Night in Canada provides sharp analysis of games, but knows when to keep his trap shut and let his play-by-play man call the action. I don't know what has happened in recent years, but analysts are highjacking the games. The art of play-by-play is being squashed by a bunch of blabbermouths who can't wait for a stop in the action to wow the audience with their observations and opinions. I'm not saying there isn't time when a good analyst can speak during the action, especially now that many of them or located at ice level where they have a much better view of the action. But some analysts now speak more than the guy in charge of calling the action. TV producers would be wise to rein them in. The Canucks certainly made it interesting and exciting...More so than it should've been, possibly? After building up a 3-0 lead, they let the Hawks back in the game, all the way back in fact as they tied it up at 3-3, only to see Sami Samo bang in a rebound with just over a minute left for the winner. Drama for sure. The Hawks need to be commended for never saying die. The Nucks at the same time need to learn to not be so darn PRETTY all the time. Just my humble opinion. Three passes too many. I know with a 3 goal lead you can afford to be a little cute. But too cute sometimes leads to BLOWING THREE GOAL LEADS. The Nucks were up 3-0, they had all the momentum, they had a four minute power play. And three or four times they made three or four passes too many. Just put the thing on the net, and good things will happen. Squander momentum and power play chances, no matter what the score is, and bad things will happen. Catch game two tomorrow with the pregame at 5:30 and the play-by-play shortly after 6:00pm on 93.3 The Peak FM, part of the Canucks Radio Network. 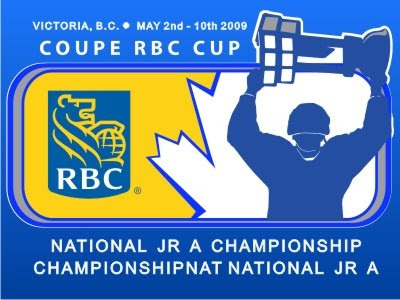 We've heard about it for a couple of YEARS now, but finally the 2009 RBC Cup kicks off tonight in Victoria. Gold In The Net's Aaron C Cornwell Memorial Golf Tournament goes tomorrow at Morning Star Golf Course. I will be playing the in the tourny, and I will also be the MC for the banquet afterwards. Spots are still open, but register A S A P if you want to play tomorrow!